I have gone through quite a few iterations of what I would consider the optimal backpacking gear setup. Historically I have been a ground dweller that lived in and under tents and tarps, but no longer. After having so many nights of terrible sleep and waking up feeling like I was 80 years old with arthritis, I decided to look for something lighter and more comfortable. For a ground dweller those terms seem to be mutually exclusive, where comfort means more weight and less weight means less comfort. However, after doing research I found the world of backpacking hammocks. At first they did not seem to be a realistic choice, with all the options and complexity that goes into getting one of these setups. Not to mention I was really worried about how I was going to stay warm and dry in one. My curiosity made keep contemplating them and I finally decided to get a cheap one to test. I got a Ultra-Light Travel Hammock from EMS for around $15 when they had a sale and gave it a go. 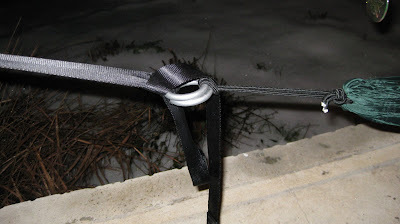 I had it strung up in the yard within minutes and gave it a test. I played with it some more and decided that it was worth pursuing. The only hangup I had for the Travel Hammock is that it really won't cut it camping here in New Jersey as is. It does not have a bug net to keep out the swarms of insects nor does it have a tarp or any way to keep it dry in our torrential downpours. But thanks to one of the best communities on the Internet, Hammock Forums, I found a myriad of solutions to resolve any of my hang ups. 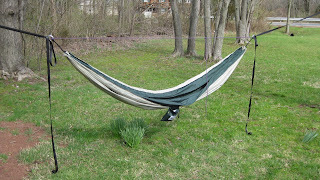 Hammock: Modified Ultra-Light Travel hammock. I added a second layer to the hammock in which to hold a closed-cell foam pad. Suspension: The stock ropes that come with the Travel hammock just doesn't cut it as they are too short to accommodate most tree distances, nor do they provide adequate protection from scarring the trees. I replaced each rope with 12 foot seat belt straps from StrapWorks and added two aluminum SMC descending rings on each side. 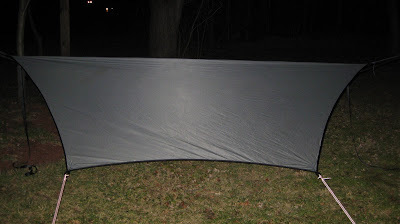 Tarp: I vacillated on how to keep dry and was always scared off by the cost of buying a backpacking tarp. I looked at building one but by the time I got all of the materials acquired I could have bought a pre-made tarp for the same cost. In the end I got a Spinntex Deluxe tarp from OES, it weighs less than 10 oz and provides ample protection from the elements. The best part about it, is that it does not allow moisture through like sil-nylon when you brush against it while under it. 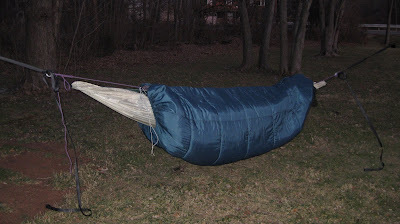 My main insulation is a closed-cell foam pad that slides between the two layers on the hammock. For NJ weather it seems to be adequate and also a really cheap solution. 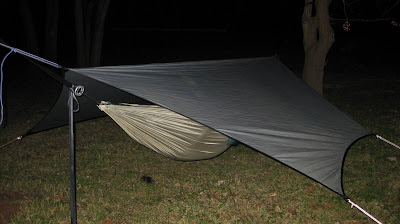 When I went camping with the scout troop over New Years I used a pad and also sleeping bag over the top of the hammock. It was way to warm, I woke up sweating in 11 F. degree weather.